Good morning! I am astonished to report that, not only did I reach last Tuesday's weekly goal of completing half (24) of the blocks for Lars's Mission Impossible graduation quilt, but my mom and I got ALL 48 blocks done last week. Woo-hoo! They are all laid out on my design wall now, waiting to be sewn together. Mission Impossible: All Forty-Eight 12 inch Blocks Complete! But while I'm pondering those things, I took a little detour and went back to that vintage quilt repair that I'm undertaking for a friend. I had my 'Nina 750QE all set up for invisible machine appliqué piecing from the inside curves on those flying geese blocks, and that's the same technique I wanted to use to patch the vintage quilt. All I needed to do was switch from the Smoke monofilament to Clear monofilament. Here's what I know about this quilt. It was made by the grandmother of my friend (who is about to become a grandmother herself in a few months), and my friend's husband remembers seeing it in her parents' house before they were married. Those are the only facts I know so far, but I've asked their daughter to try to find out more so I can make a label from the quilt when I've finished repairing/resurrecting it. 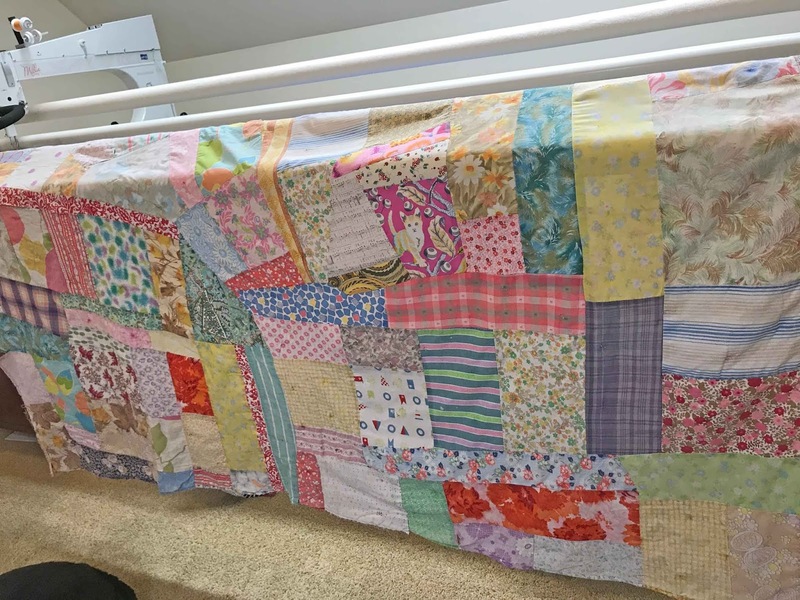 As I began taking the quilt apart, I realized that the fabrics of the quilt top were faded and weakened from UV exposure -- my friend had been using it as a picnic blanket under the Carolina sun for many years. 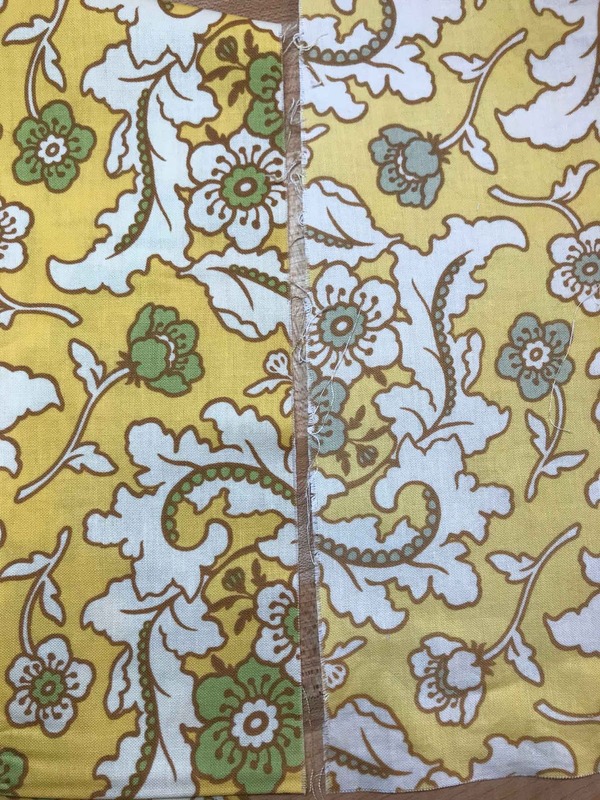 See how much more vibrant that paisley print is where it was covered by the binding fabric? See How Vibrant That Pink Used to Be, Under the Binding? I wish I'd taken pictures of this quilt front and back when I first got my hands on it at the beginning of February. The bright orange backing fabric was shredding, hanging off the back of the quilt like ribbons, and exposing large sections of batting. The front of the quilt had several large holes where fabric was shredding and disintegrating across multiple fabric patches. The original quilter had tied the quilt with yarn at 4" intervals rather than quilting the layers together, so I went into this with the idea that I would remove the binding and snip the yarn ties to separate the quilt layers, patch those large holes, and then layer the top with new batting and backing and machine quilt it on the longarm. I did not even consider tying it with yarn again because the fabrics are so weak and the yarn ties were putting too much stress on the fabrics. In several places, the knot of yarn had ripped right through the quilt top. I think that quilting stitches will do a better job of marrying the top to the new batting and backing so they function as one, allowing the fragile quilt top to benefit from the strength and stability of the other quilt layers. One more surprise challenge was the construction of the quilt top itself. 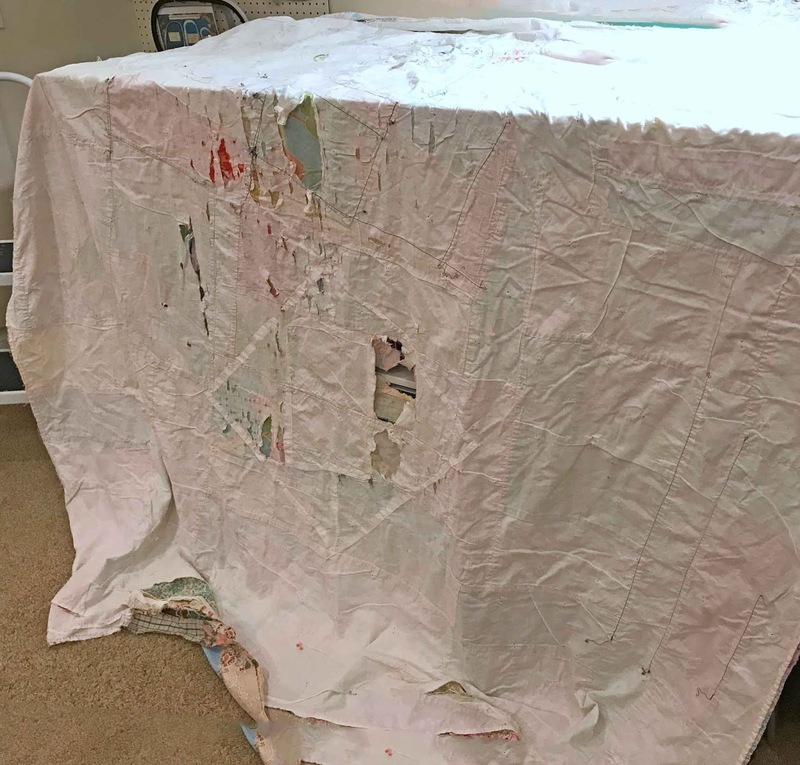 There was a base or foundation layer comprised of several different white fabrics that appear to cut from cast-off garments and linens. 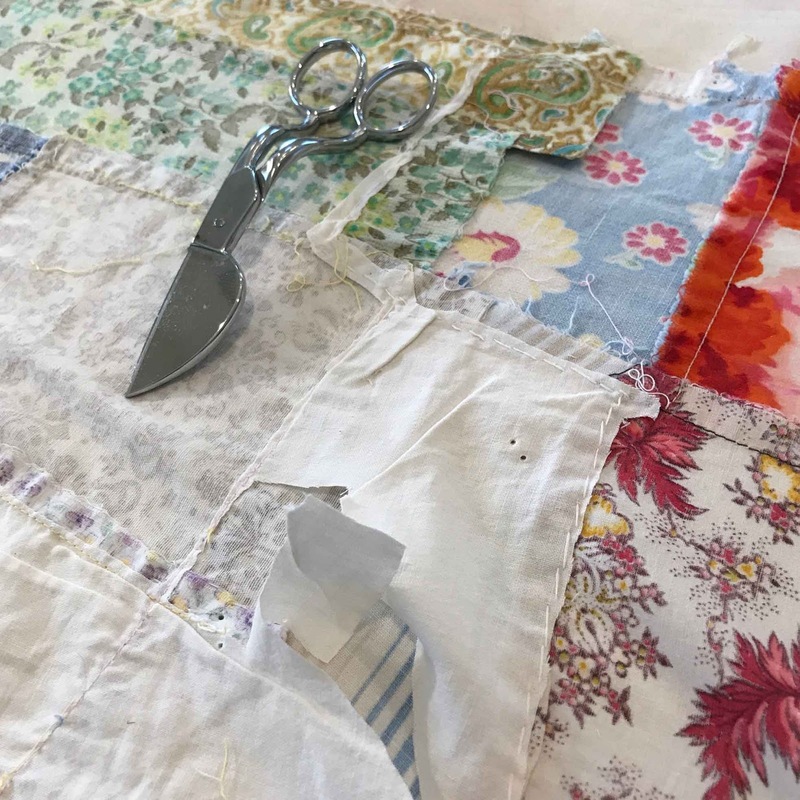 Like the quilt top, the base layer fabrics are different weights, different weaves, some cotton and some synthetic blends, and the quilter did not bother to remove seams and hems from these pieces before sewing them into the quilt. 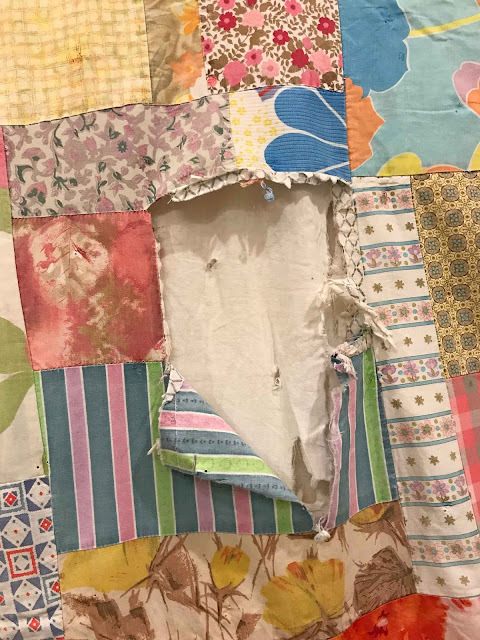 Upon initial inspection of this quilt, I'd planned to leave the base layer intact, but once I got the quilt apart I discovered that the foundation was not salvageable. 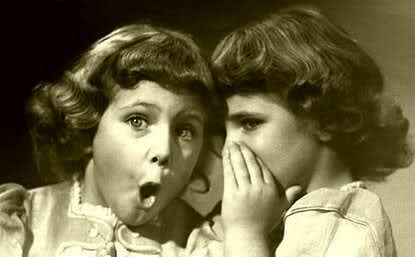 It was badly shredding, those bulky seams and hems hidden beneath the quilt top could cause problems for machine quilting, but the kiss of death was the realization that the assorted fabrics in the base layer had shrunk at different rates from one another and at different rates from the fabrics in the quilt top. It was all pleated and puckered where it wasn't shredding, making it impossible for the quilt top to lay as flat as it could without the backing. Oh, and the WEIGHT of the base layer was making it difficult for me to handle the quilt top for repair without ripping it. The construction method was kind of haphazard, with the quilt top fabrics pieced together in a random fashion similar to the improvisational piecing of today's modern quilters, and then those sections of pieced fabrics were sewn to the foundation fabrics only intermittently, with gaps of up to 14" between stitching lines that held the quilt top to the foundation. However, some -- but not all -- of those seams were holding the quilt top patches together as well as attaching the to the foundation. So, over a period of several days, I carefully snipped away the foundation fabric between stitching lines, using my duck billed appliqué scissors to avoid accidentally snipping into the quilt top. 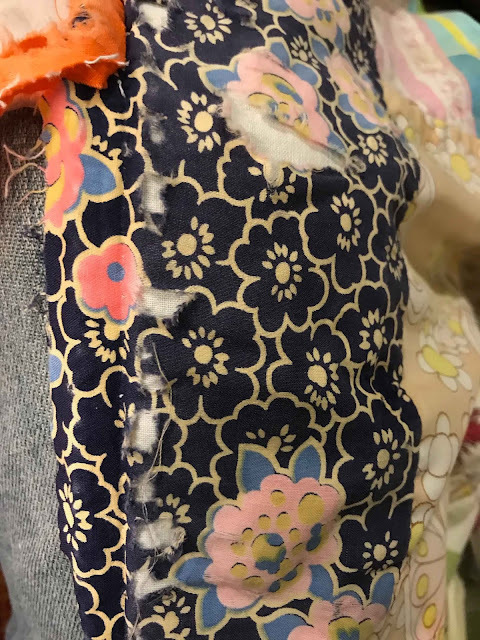 There are also quite a lot of hand stitched repairs to the quilt top made by my friend that go through the foundation fabric as well, and I felt that those stitches were part of the quilt's history that needed to remain so I cut around those stitches as well. 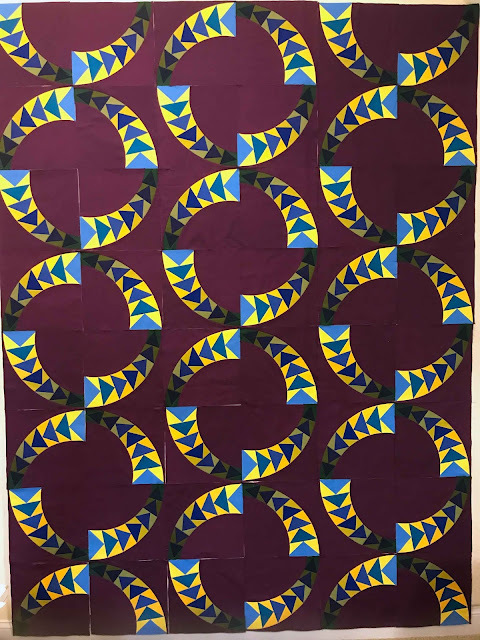 And of course, historian and vintage textile lover that I am, the whole time I'm working on this I'm trying to pin down an approximate date for when the quilt was made. 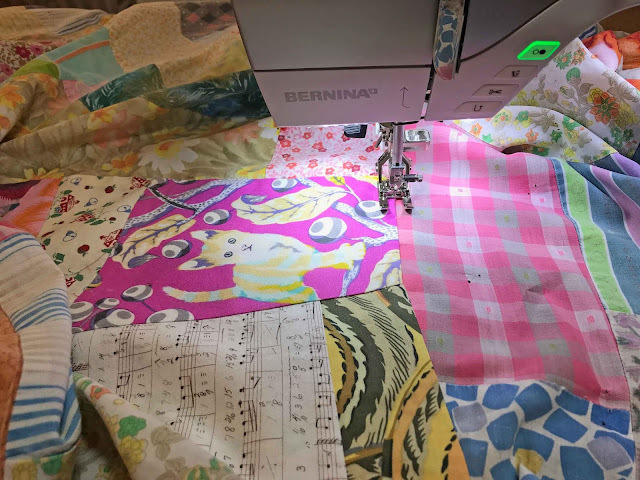 The number one rule of dating a quilt is that a quilt cannot be older than the youngest fabric in the quilt, and this one had polyester batting and polyester-blend fabrics. 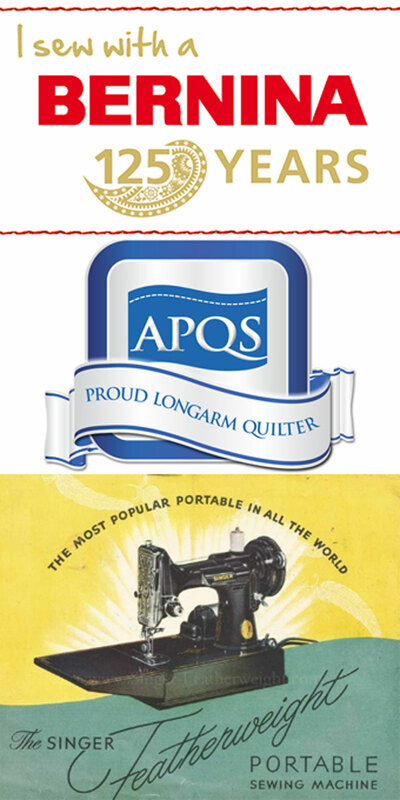 I know that polyester fabrics were introduced to the market after World War II, but I have not been able to find out when polyester quilt batting was first sold. If anyone knows, please let me know in the comments! As for the colors and print patterns in the quilt top, those are telling me 1960s or 1970s, especially when I consider how much wilder and brighter all of the colors would have been before the fabrics faded. I'm also factoring in what I know about the history of quiltmaking in the United States in the 20th century. 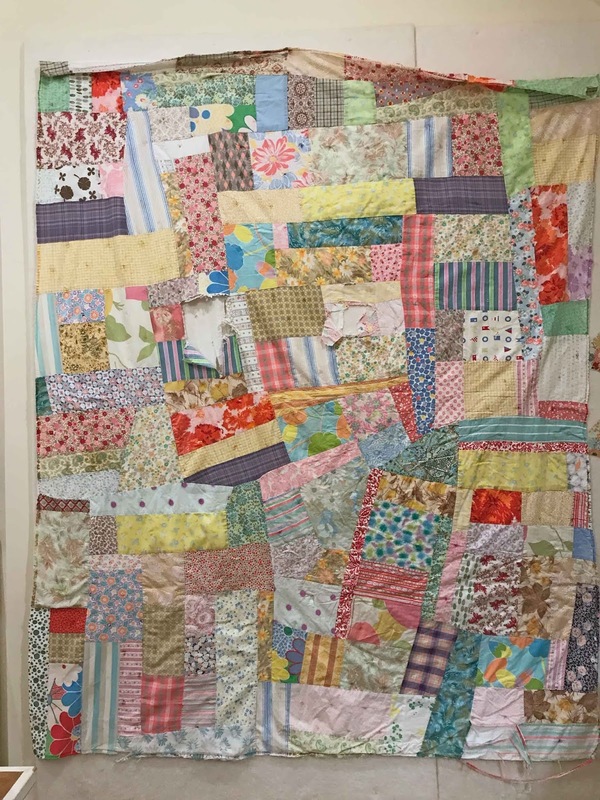 Quilting fell out of vogue post WWII with the growth of consumerism, readily available and affordable commercially made bedding, and people associating patchwork quilting with the hard times and "making do" of the Depression and war years. Some of the older quilters continued making traditional quilts for pleasure, but this particular quilt doesn't mesh with styles that were popular with quilters in the 1950s and it's free-form construction and lack of uniform seam allowances suggest to me that this was made by someone who was new to quilting, someone who had not been taught by previous generations, someone who was figuring it out as she went along. I feel like this quilt belongs somewhere in the Quilt Revival of the late 1960s-1970s... 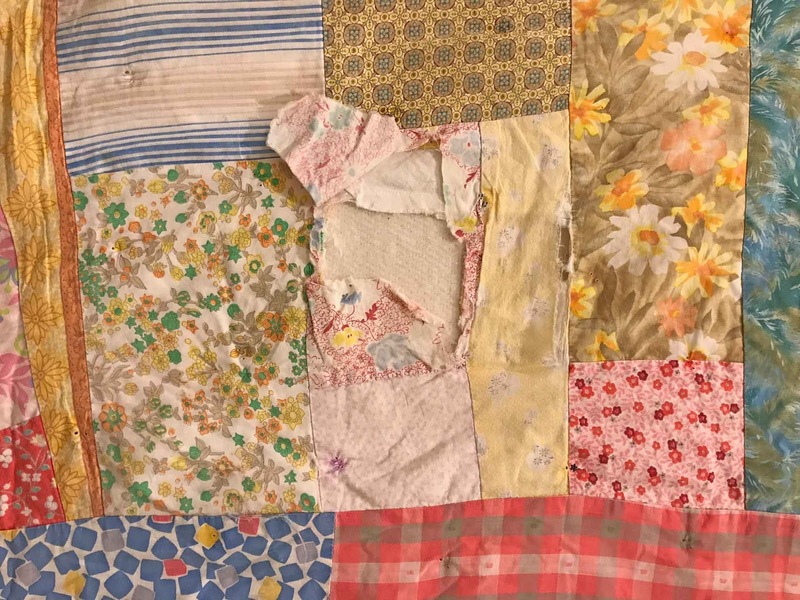 EXCEPT... My friend said her grandmother made this quilt, not her mother, and that detail makes me lean towards an earlier date (1960s) versus a later date (circa Bicentennial quilt revival in the mid 1970s). Also, while the construction of the top suggests a beginner quiltmaker, the yarn ties were precisely spaced in a 4" grid with knots that held the test of time, and the double-fold binding was neatly and skillfully finished by hand. I did ask the great-granddaughter to try to find out which grandma made this quilt, where/when she lived etc., and I'll be interested to learn how accurate my quilt sleuthing has been. Y'all, if you are still out there making quilts without labeling them, you are going to drive people like me NUTS in the future!! For those really big holes in the quilt top, I randomly pieced some odd-shaped scraps together first and then appliquéd them over the damaged section of the quilt top. It was challenging for me to abandon straight lines and right angles in order to create a patch that didn't look like an obvious later addition. I am just smoothing the quilt top over my ironing board, getting it as flat and smooth as possible, and then laying my patchwork patch over the damaged section, trying to match the edge of my patch to a seam line wherever possible. I am turning the seam allowance under by hand, without measuring, deliberately making it a little wonky, and then flattening it with the steam iron. When I'm satisfied with the patch and its position on the quilt top, I secure it with a bead of Roxanne's Glue Baste-It just along the edges and hit it with the iron again to dry the glue. And then I machine stitch the patch in place the very same way I was doing the invisible machine applique stitch to secure the inner curve on my geese blocks. Now, I know what y'all are thinking -- your eagle eyes have spotted Tula Pink and Kaffe Fassett prints and you are judging me for putting such hallmark 2018 fabrics into a circa 1965-1979 quilt top. 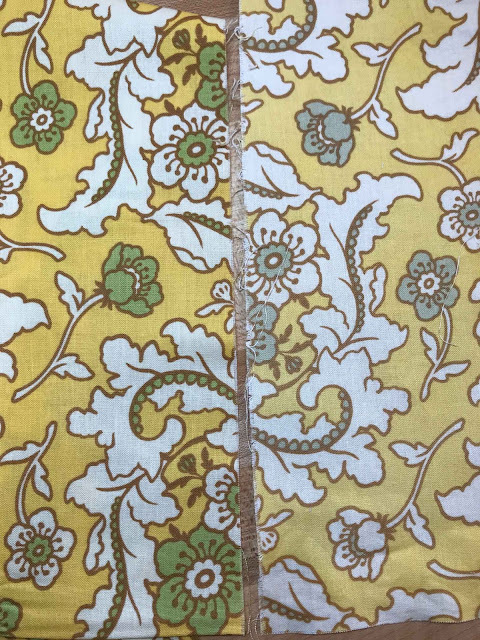 Well, I feel like Kaffe's and Tula's prints have a heavy 60s-70s influence that works with the other prints, and they bring back some of the life and zing that the original fabrics have lost to fading. They would also help a future quilt historian to easily date when the repairs were done, in the even that my new label falls off (or if I'm not able to get enough information to make a label). 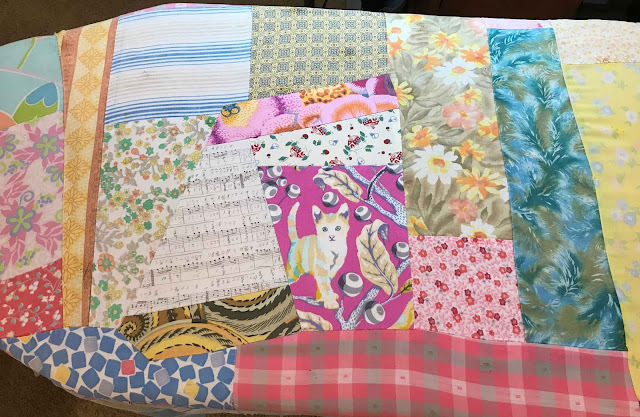 But I selected the musical notation fabric and the disco kitty specifically with the quilt's current owner in mind, because she is an amazing (like EARTH-SHATTERINGLY amazing) singer and cat-lover who was recently deprived of a kitten under dubious circumstances. So the kitty stays! For the repair shown above, I bleached the coral floral print fabric and the Kaffe Fassett print on the right, but did not bleach the little schoolhouse print or the jelly roll strip of lavender Kona Solid. After stitching, I flip the top over and carefully snip away the damaged portion of the quilt top beneath my repair. My invisible machine appliqué stitch is similar to a blind hem, but it's actually a tweaked Vari-Overlock stitch with a very narrow swing bite and tiny, short straight stitches between the zigzag. Although I'm using clear monofilament thread in the needle, I've wound a medium beige 60 weight Mettler cotton embroidery thread in my bobbin, so you can see what my stitch looks like on the back of the quilt top - it's that jaggedy brownish zigzag. See How Nicely That Repaired Section Blends Into the Quilt Top? So now that I've taken care of the sections of the quilt top with the most severe damage, I'm sewing open seams closed where I find them and patching smaller holes. 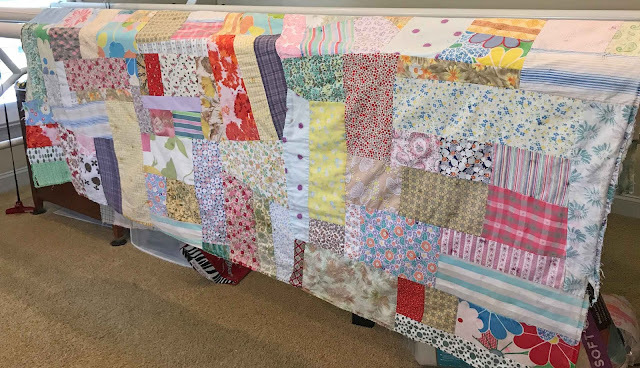 There are a number of places where the quilt top fabrics have torn right along the seam lines and smaller holes sprinkled throughout the quilt. 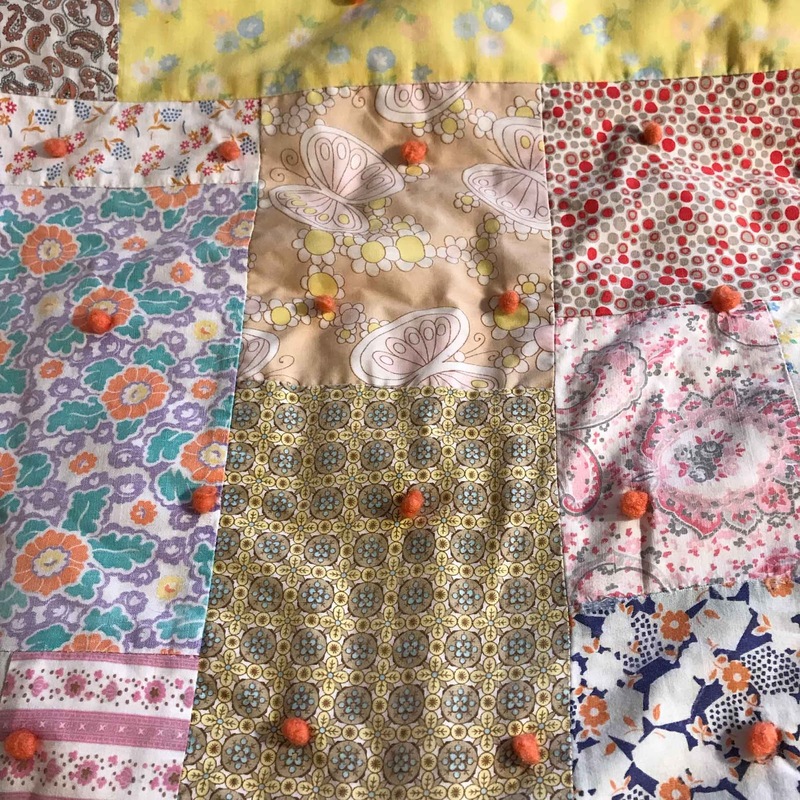 It has to be a balancing act -- there are so many fabrics in this top that are worn to the point that you can see through them, but if I replaced ALL of them it would change the quilt top to the point that it would no longer be recognizable as the same quilt. Remember that I'm already changing the backing and binding fabric and I'll be quilting it instead of tying it with yarn again -- those are big enough changes. So I'm just going to focus on the most severely damaged areas, fixing the worst hole and then the next-worse hole and so on until it gets the the point where the top can be successfully quilted. I think it is really great that you are taking such time repairing this old quilt for your friend and taking the time to try to do it right. I haven't a clue on dating it. I have an old quilt that my aunt gave me 10 years ago that she feels her mother made - except none of us ever remember seeing grandma make anything other than clothing - this was my father's late mother - plus to add to the confusion there was a slip of paper in the bag with the completed mess of a quilt that is falling apart with my mother's mothers name on it!! My aunt felt that maybe the two women exchanged some quilt blocks for the quilt - but my mother swore her mother rarely ever sewed and would never have made a quilt block LOL - so who made the quilt? one will never know as the older generation except one uncle is still alive and he hasn't a clue!! I would do the blocks into large blocks like you are thinking - it should all be easier to line up that way I bet. How exciting that all of the blocks are done for Lars' quilt! I know you are doing the happy dance. 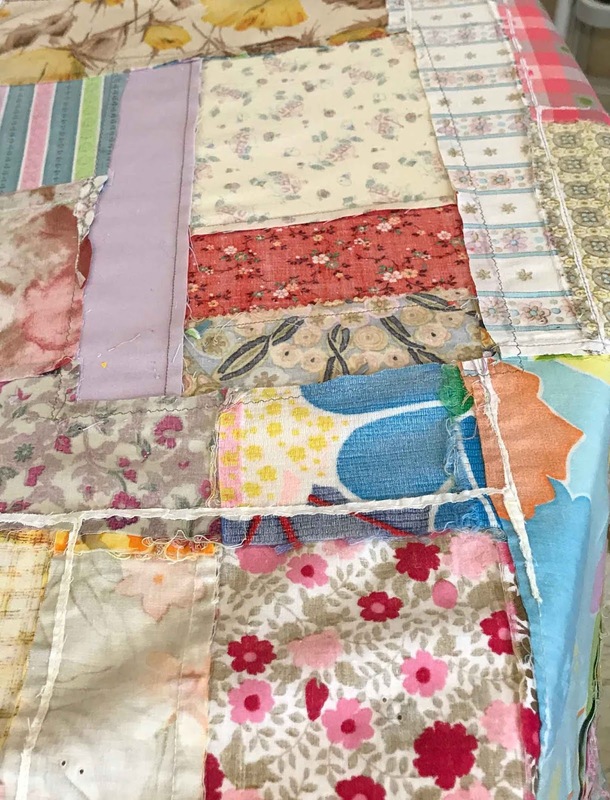 What an undertaking...repairing the vintage quilt for your friend. You are doing a great job of replacing fabrics and blocks of fabrics. Happy quilting! Wow. Your quilt repair job is looking so great so far. Your friend will be amazed at your skill and determination. The kitty fabric fits in nicely. I agree with your comments on a label for quilts. It's so important to do. I didn't used to feel that way and it was a struggle to make and sew a label on. Somehow the worm turned and I'm now adamant about getting a label on. Thanks for putting label advice on your post. Wow! You have an incredible amount of patience! My first thought - probably wouldn't have been repair. What a gift! It is a great adventure watching you repair that quilt. My first quilt was made in 1976 made with whatever fabrics were in the fabric store. I knew little about quilting fabrics and just purchased what seemed to give the feel I wanted to the quilt. The funds for the quilt came from my moms side of the family as wedding gifts stuck in the wedding cards. Moms family were big quilters and I thought that would be a way of creating a lasting memory of their acknowledgement of my wedding. Now, 40 plus years later, I have tatters in that quilt from being used so many years. My mom hand quilted the king sized quilt for me. 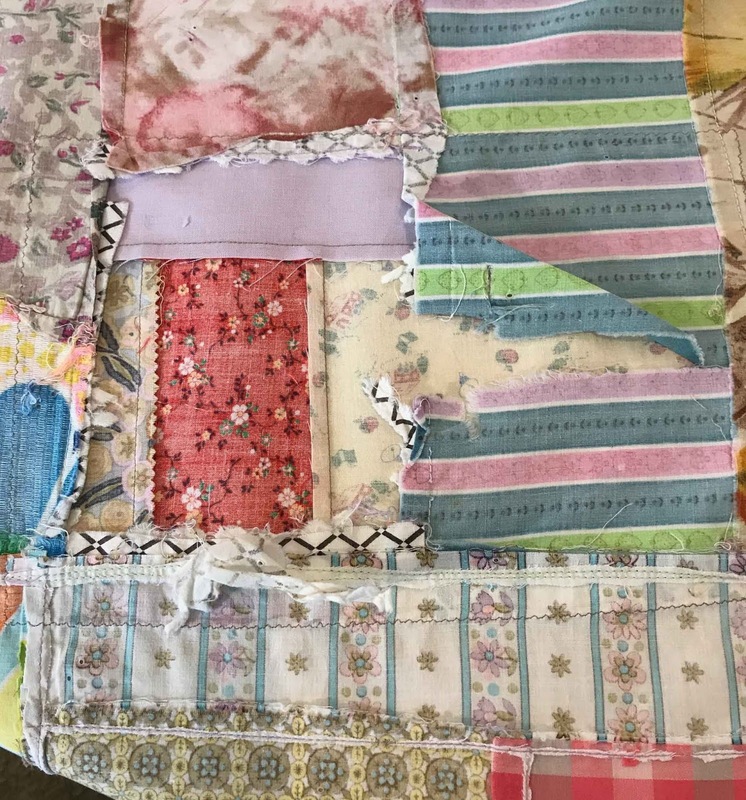 In trying to repair the quilt I did find I had a mix of textiles. Lots of Polly and Esther, cottons and a polyester batting. It is tucked away as I have no more blocks left from the original making of the quilt. (Yes, I saved the extra blocks and fabric for YEARS). It was repaired over the years. It is now at a decision point, take it apart to restore by putting in new batting and repairing shredded blocks, get rid of it or leave it and repair from the top only. Since my mom hand quilted it, I’d hate to take it apart. I do not think anyone in the next generation would want it as it is in the avocado, gold and brown of the mid 70's. It’s definitely not something my daughter wants. I took a class at night school and first learned of rotary cutters and cutting mats and purchased a set. The instructor stated the rotary cutter was developed for garment sewing but quilters latched on to it quickly as it made cutting quick if you added a ruler. I do not know the truth in that statement but I have passed that along for years. 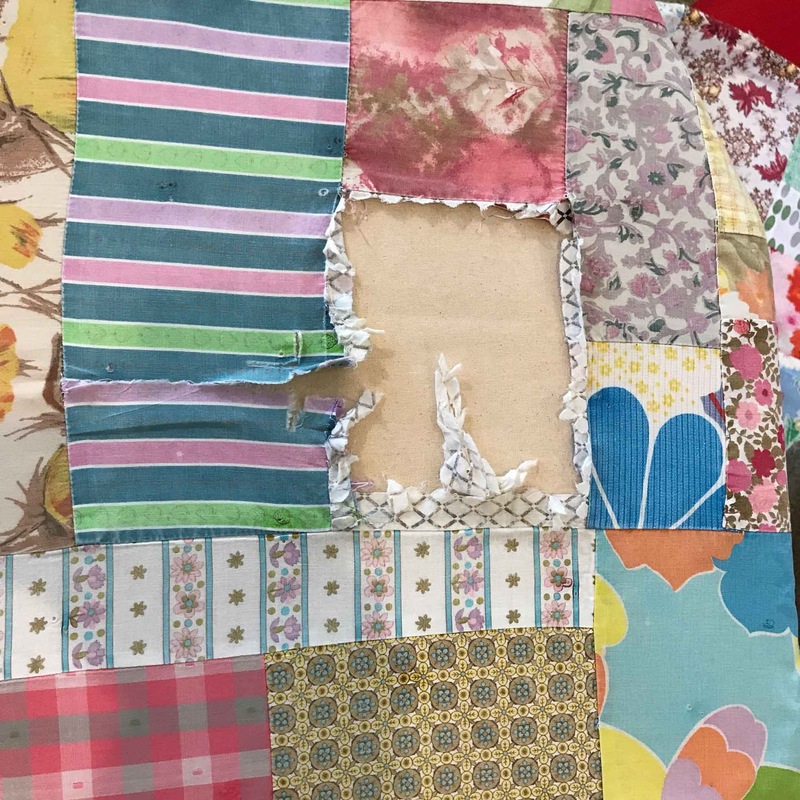 I look forward to the end results if your repair and of the progress on Lars's quilt. You are on track and things are looking great! Good luck meeting your goals this week. Congratulations, your Mission Impossible is so beautiful! I'm very impressed by your repairing job, this quilt is going to be like a very new one! 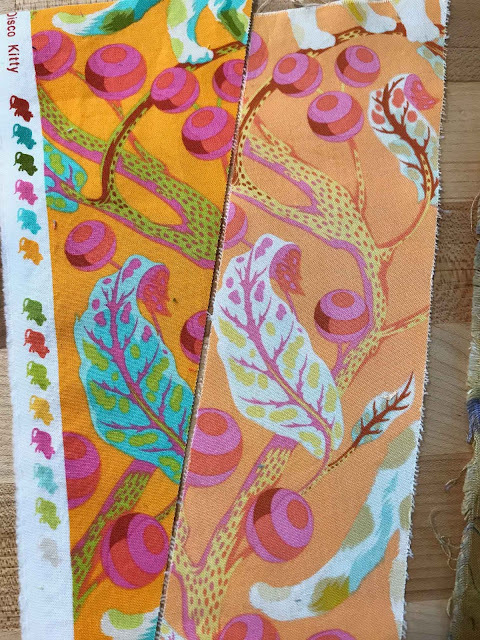 Great tips about making fabrics older than they are. Wow! Quilt repair seems so daunting a task. I haven’t had to do one yet, but I’m sure there will come a day. Thanks for sharing your process with us. Well, I must say, what a 180 degree turn on this page! 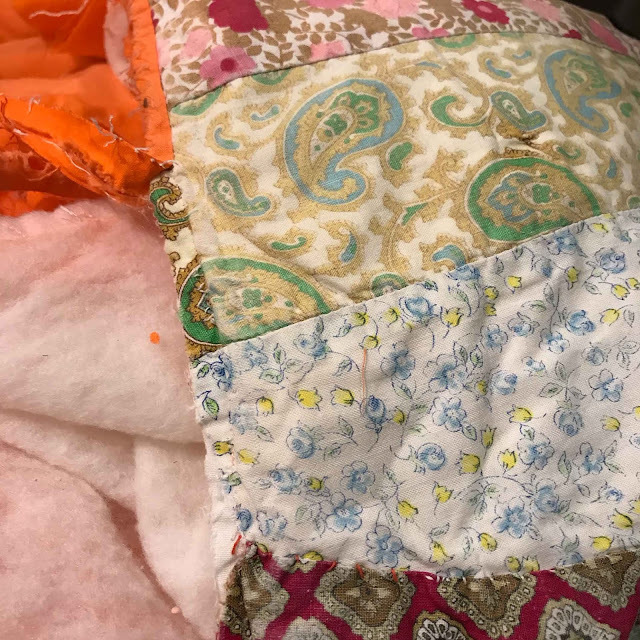 First, a beautiful quilt, with it's bold colors and bursts of brightness in a controlled manner to a wildly random ancient quilt that needs major repair. Kudos to you for tackling both! 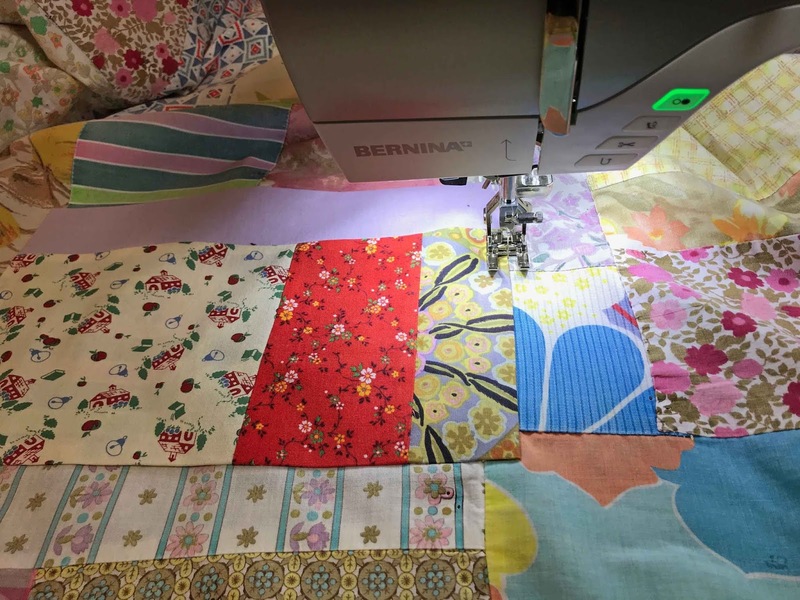 Hi Rebecca, you have an amazing amount of patience and resourcefulness to be working on that old, lovely quilt. I really like your explanations of what you are doing and why. Thanks for sharing and good luck!